A deadly fire exposes the dark side of Amish life in A Gathering of Secrets, a harrowing new thriller in the New York Times bestselling series (July 2017) by Linda Castillo. When a historic barn burns to the ground in the middle of the night, Chief of Police Kate Burkholder is ca... read full description below. A deadly fire exposes the dark side of Amish life in A Gathering of Secrets, a harrowing new thriller in the New York Times bestselling series (July 2017) by Linda Castillo. When a historic barn burns to the ground in the middle of the night, Chief of Police Kate Burkholder is called in to investigate. At first, it looks like an accident, but when the body of eighteen-year-old Daniel Gingerich is found inside--burned alive--Kate suspects murder. Who would want a well-liked, hardworking young Amish man dead? Kate delves into the investigation only to find herself stonewalled by the community to which she once belonged. Is their silence a result of the Amish tenet of separation? Or is this peaceful and deeply religious community conspiring to hide a truth no one wants to talk about? Kate doubles down only to discover a plethora of secrets and a chilling series of crimes that shatters everything she thought she knew about her Amish roots--and herself. As Kate wades through a sea of suspects, she's confronted by her own violent past and an unthinkable possibility. 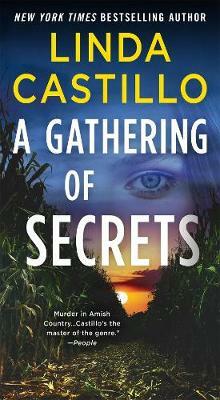 LINDA CASTILLO is the New York Times bestselling author of the Kate Burkholder novels, including Sworn to Silence, which was recently adapted into a Lifetime Original Movie titled An Amish Murder. She is the recipient of numerous industry awards including a nomination by the International Thriller Writers for Best Hardcover, the Daphne du Maurier Award of Excellence, and a nomination for the RITA. In addition to writing, Castillo's other passion is horses. She lives in Texas with her husband.